How was your start to 2018? Broome SES had a very busy start that actually began just after Christmas. Everyone was enjoying the down time before New Year when a tropical low headed our way. 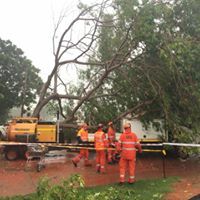 As Broome SES started to prepare the community for the possibility of destructive weather through social media the rain started to fall. Cyclone Hilda formed over the top of Broome itself increasing to a cat 2 as it departed off the shore. This was a little bit more rain and wind than we were wanting! Members donned their orange and headed out to assist the community as multiple requests for assistance came in. The unit activates and over two days SES Volunteers attended 34 RFA’s involving flooding, water coming in to houses through roofs, windows and doors, holes in roofs, trees down on properties, etc. 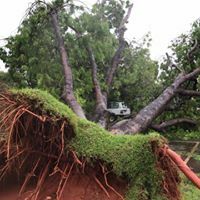 Thanks to the assistance offered by the Broome VFRS, BFB and Parks and Wildlife the members of the Broome SES looked after the town. 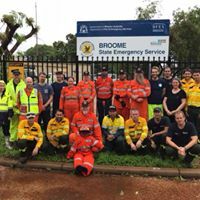 Over the two days Broome saw wind gusts of up to 139 km/h while Volunteers contributed approximately 150 hours to callouts and incident management. The Local Manager and his family head away on holiday after what was thought to be the busy part of the wet season…. But as always happens when the LM is away, the weather starts to build again. Another tropical low heading our way from the NT, looking like it has the potential to build into a strong cyclone and cause trouble for the already wet town. Social media is busy again ensuring that the community are as prepared as can be along with keeping them informed about the current warnings from BoM, DFES & Main Roads. The unit goes active again, ensuring that if this one is strong they are ready to deploy teams locally- and yet TC Joyce passes the town by without causing too much damage. Only 4 calls for assistance this time round. However, members still contributed 120 hours in preparedness. Right, we must be done now then. The manager has returned, two cyclones in under 3 weeks, that’s us……….. However, another Tropical Low forms and is predicted to follow the same track as both TC’s Hilda and Joyce. Again, supporting DFES through social media the Unit starts preparing the community and alerting them to warnings, road closures, and information to help them to prepare for potential flooding with the predicted closure of the only two roads into Broome for supplies. This time the Tropical Low does not quite reach cyclone intensity, however it is a monsoonal tropical low travelling very slowly. This means that in just 24 hours, Broome receives 439.4 mm of rain (the wettest January day on record) and in total over 5 days it receives 697.2 mm of rain. This on top of already wet ground and fallen trees, roof damage etc means that the Broome SES is once again active. The unit stands up as an Operations Centre and the Volunteers work tirelessly to assist those members of the public in urgent need. This time urgently evacuating people from houses that were becoming unsafe to stay in due to water inundation, navigating flooded roads, again covering holes in roofs, fallen ceilings, trees down on properties, lots and lots of sandbags. By the end of the three days most members had forgotten what it was like to be in dry overalls and were dreaming of a holiday somewhere away from water! Anywhere away from water. They had completed 90 calls for assistance and completed 180 volunteer hours. Once again with the wonderful help from Broome VFRS, BFB, & Parks and Wildlife. The town is now cut off both North and South and therefore effectively becomes an island in its very own right! 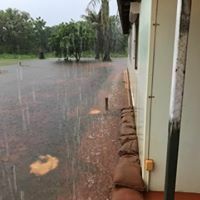 Coles and Woolworths deliver food to the town by barge and plane as Roebuck plains is impassable with over 500mm of water sitting on the floodplains and road. Social media, preparation, ready the unit, alert the community to the warnings and here comes Cyclone Kelvin. Kelvin passes Broome dropping again a substantial amount of rain, in fact 376.8mm in just 24 hours. This leads to Broome recording it’s wettest year on record at 1506 mm and its only February! Just as the roads were opening and no- they close again. Due to the high water table at this point, the town suffers severe flooding again. Houses are sandbagged, residents are evacuated, already soaking wet ground allows more trees to fall and members don the orange once more, just as the laundry had dried out…. The next day Kelvin crosses the coast at Anna Plains Station. As soon as the winds and storms have died down enough Broome SES Volunteers are helicoptered south to help resident’s clear fallen trees from roofs and repair damaged buildings to make properties safe to live in where possible. Other members fly out to do food drops to stranded communities along Cape Leveque as some of those have not been able to get out for weeks now. Our now pro storm damage volunteers attended multiple requests for assistance and contributed hundreds more hours. And its not all about storm damage…… Broome SES has also attended a remote rescue, and air search, and been on standby for other operations. Now this was only the first 2 months of 2018 and Broome has already seen its wettest January Day on record, wettest February day on record and beaten its wettest year on record. As of late March, there are still inaccessible areas, with one resort having to transfer guests by boat and helicopter as 10km of its driveway are still underwater! What on earth does the rest of 2018 have in store for us……?